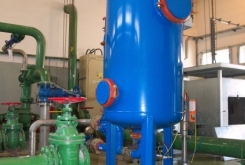 KEUV-CV treatment plant for cooling water is designed for the protection of cooling towers and heat exchangers from clogging, for continuous filtration of insoluble substances and for disinfection of water in cooling circuits. This way it replaces several devices at a time. While cooling water gets heated calcium carbonate equilibrium shifts in the direction of calcium carbonate precipitation. Moreover, impurities contained in the air get absorbed in the cooling towers. These impurities together with precipitated salts cause the formation of sediments, biofilms and rust in the cooling circuit. 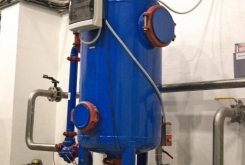 Water treatment is therefore an indispensable part of the process. 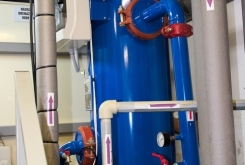 In case of large circuits, both opened and closed ones, this problem can be solved with dosing of various chemicals like corrosion inhibitors, dispersants, biocides and bio-dispersants. 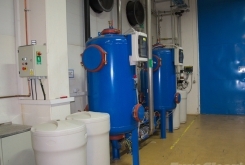 This traditional system of chemical protection is not environmentally friendly, requires qualified and skilled operation staff, and controls carried out in a chemical laboratory. 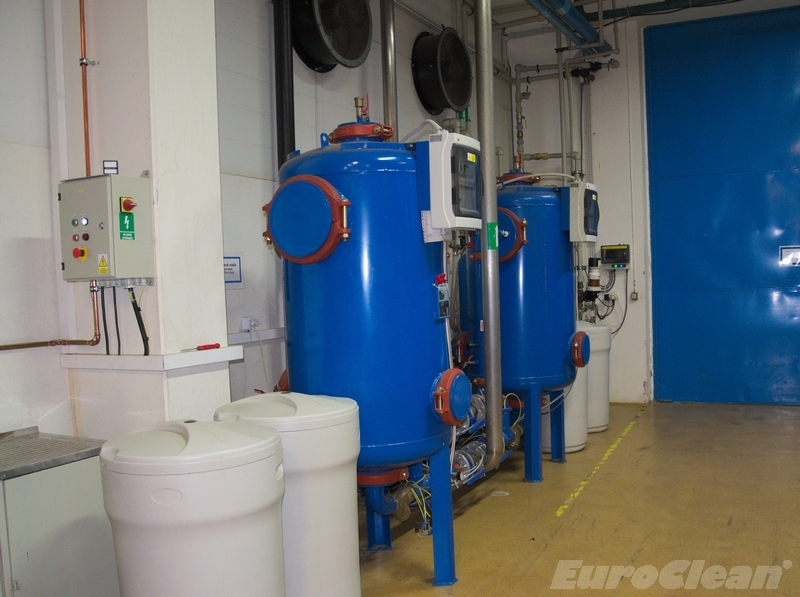 These drawbacks can be eliminated by using the electrolytic water treatment plant for cooling water, KEUV-CV. 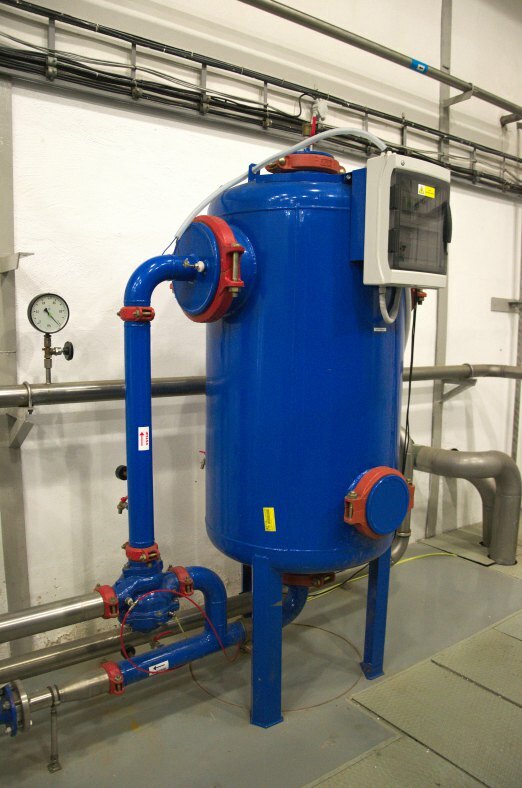 KEUV-CV water treatment plant is a compact apparatus that contains an electrolyser which is integrated inside a pressure filter. When exposed to direct current, controlled formation of limescale occurs on the cathode and oxidation processes on the anode. Oxidised forms create a precipitate that gets filtered out on a sand filterbed. Several other impurities from water get caught on the iron precipitate as well. 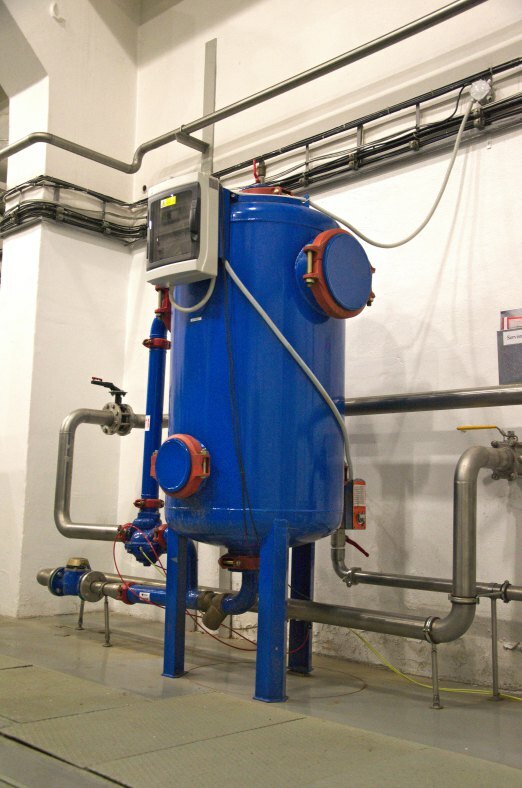 The sand bed gets automatically flushed out in regular intervals and the impurities wash away into the sewerage system. 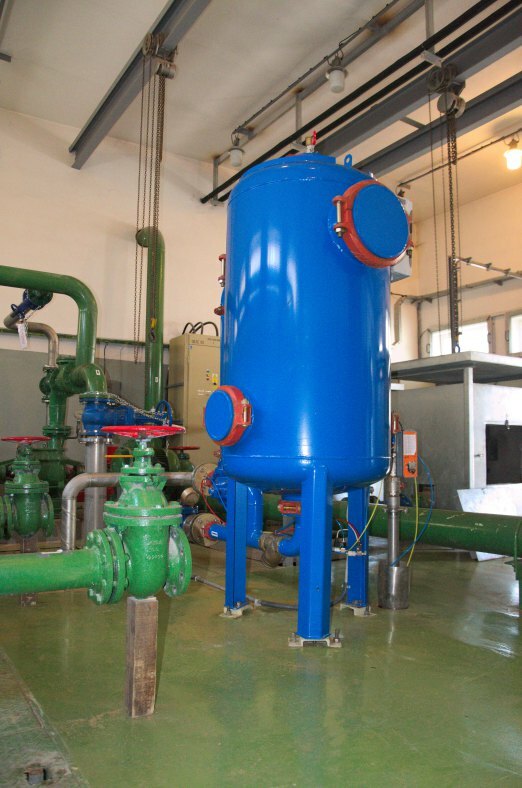 The water treatment plant usually gets installed on a bypass piping at the output of cooling circuit pumps. 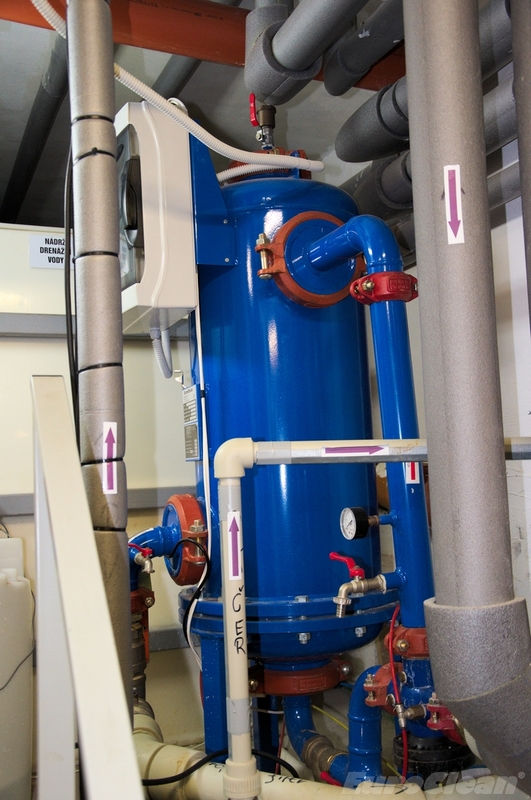 It usually is 5 to 10 per cent of the circulating cooling water that passes through the water treatment plant. The effect of KEUV-CV shows immediately. 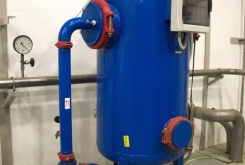 The process is environmentally friendly, without using chemicals and it requires no involvement of the operation staff. We have to transport the water treatment plant KEUV-CV to the place designated for installation. Then we connect it to the cooling circuit and to the electricity network. The outlet of the flushing water has to be introduced into the sewerage system, and finally we set up the equipment and put it into operation. A two in one device, providing both coagulation and filtration. Low energy consumption.